I just couldn't leave well enough alone... I've gained a new two-wheeled member to my family! I've got enough bikes, right? I mean, there's the Manhattan, the Felt, the Kustom Kruiser... Oh, and the JC Higgins, but that's not ridable right now... or the "Mystery" bike in the shed... or the Road King chopper... oh, and the Ross Polo Jr. that'll be a banana bike one day... Ummm... my mountain bike I guess... Yeah, right. Last few rides home we've been passing by Sports Junkies on Broadway (which is where my Manhattan came from) and peering in the window at a couple of sad, low-end cruisers sitting there (a Norco and a Raleigh)... Ugh... But the other day I spotted a Manhattan Trucker sitting there with a "reasonable" price tag on it. I've been really in to the "Trucker Girls" - they're on the chain guard and both fenders too. OK, gotta take a look at that. But at the same time, I've already got a Manhattan that's had a LOT of work done on it to get it to a place where I'm happy with it... Hmmm... Well whatever, not like I'm going to buy it anyhow, right? Today after work I popped on down so I could actually see the bikes more than just peering through a window in the dark. Hummed and hawed over the Trucker, not TOTALLY wild about the colour scheme... It has plain brushed alloy rims which were one of the first things to go on my other Manhattan, and that wasn't exactly cheap... I just wasn't sold. 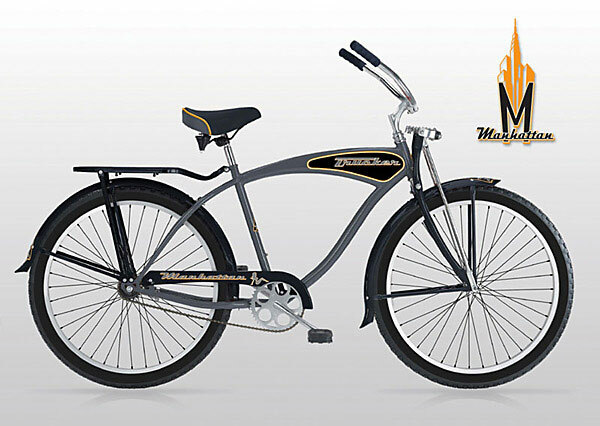 When it comes down to it the Manhattan in its stock form is a fairly low end cruiser - it's not as bad as what Schwinn has become these days but it's certainly not on par with Electra or any of the others. But that Hampton Cruiser... The paint job was even better than I thought, plus it turns out the bike is alloy! Took the bike out for a test ride - some definite mechanical issues but I'm not really expecting much from a Sports Junkies bike. There was a LOT of drag, coasting slightly downhill and the bike was slowing down. Lots of rattles too. The worst was a really nasty scraping sound when I was standing up, usually not a good sign on a "new" bike. Gave it a complete look over - lots of play in the bottom bracket, ok that explains the squeaky scraping sound... Back wheel was super sloppy too, that explains the drag. Well, not like I wouldn't want to give it an overhaul anyhow regardless of where I was buying it. Checked to see if they had another one in its box still by any chance, nope, turns out that's the one and only blue Hampton they had received or were likely going to receive. Well what to do, what to do. The mechanical issues weren't really a big deal to me, there is however one small scrape on the chain guard. ALMOST put me off, but in the end I figured I'd probably end up doing the same thing after riding it for a while. Decided for the price I could live with it, gave the man the money and rolled out the door. Got the bike home and did a complete service. Started with the rear hub - BARELY any grease in there at all. I personally like a fairly heavy moly grease in coaster hubs - they get really hot on hills so you need something that won't just melt and drool out the sides. Moly grease is really good for extreme pressure applications and does well with sliding parts like oh, say a coaster brake. Cleaned all the old crud out of there and buttoned up the hub again - NOW it spins nice. It's a "Hi Stop" brand coaster brake - these aren't the best quality hubs (Kustom Kruiser uses them as well) but it'll last for a while, depending on how many skids I pull on it. Next up was the bottom bracket. The play was really odd - not like the adjustment was just loose or anything. Hmmm... Tore it down, the retainer on one of the bearings was twisted like a pretzel. Great assembly job guys... Found a couple of score marks on the retainer, there's that nasty squeaky sound I was hearing before! Fortunately the cups and cones were ok. I had a spare bearing kicking around so I replaced the twisted one rather than have metal flaking off that retainer in there for ever more. Same story as the hub by the way, next to no grease in there. Anyhow buttoned that all up again, now the drive train is taken care of. The front wheel just needed a bit more grease than it had and a cone adjustment and we've got a mechanically sound bike! Went over everything else - headset seems ok, tightened up all the rest of the trim as it was all pretty loose and took her for a spin. A HELL of a lot better than my first ride around the block! All the squeaks and creaks are gone, the bike actually ROLLS properly now and the fenders aren't rattling all over the place. Most importantly now the bike is MINE and I'm not going to be forever worrying about the mechanicals since I know exactly what's in there. So anyhow, the bike has a pretty cool paint job, alloy frame and is a pleasure to ride. She's definitely mine and I think there's going to be a lot of miles on this one - it's pretty freakin' comfortable already and I haven't done squat other than set up the bars and seat. New pedals and seat are a must, what else will happen when the time is right but I'm in LOVE! !